THE TRIBUNE: Cal Poly irrigation center helps teach agriculture industry to combat drought. As a way to counter the impacts of the drought and make water use more efficient, Cal Poly’s Irrigation Training & Research Center in San Luis Obispo is in the midst of a summer session that teaches agriculture industry insiders how to update their technology and improve flow management. The center is in the second year of its program. The state of California’s Employment Training Panel allotted $234,000 to the center to train managers of farm companies, equipment dealerships and water districts on improving irrigation systems to combat the economic and employment effects of the drought. The state panel has set aside $2 million statewide for drought-related training. Classes offered by Cal Poly’s center — which range in cost from $185 to $420 — focus on drip irrigation; basic pipeline hydraulic, irrigation scheduling; landscape sprinkler design; and chemigation (using fertilizers, soil amendments and pesticides through irrigation water). Back in the classroom to save water: Cal Poly’s Irrigation Training and Research Center director Stuart Styles gives a lecture to industry professionals. Photo by Joe Johnston, sanluisobispo.com. 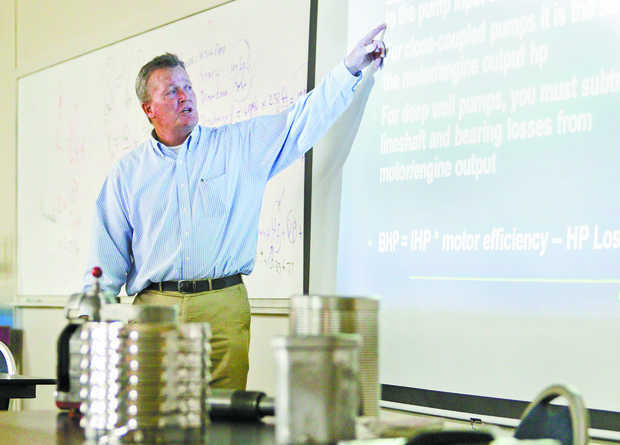 Courses held last week focused on the use of pumps, with instruction on how best to calculate flow efficiency. The 32 participants came from a range of industry backgrounds — including officials from the Oakdale Irrigation District, Orange County Pump Company, Carpinteria Valley Water District, Modesto Junior College and Nichols Farms in Hanford. “We give them the information, but we leave it up to them to decide whether they might want to replace their system or repair or upgrade,” said Franklin Gaudi, a program instructor. In addition to improved irrigation methods, farmers are increasingly using drones and other devices to calculate how much water their crops need, better enabling growers to conserve, Gaudi said. The program’s instruction also includes methods of using less energy. As water tables fall, that can mean drilling farther to access a diminishing supply of groundwater and more power to draw the water up through pumps. By calculating the appropriate amount of pump horsepower, growers can reduce the demand for electricity, lowering costs for farmers and relieving some of the burden on the grid. The program, which also has a winter schedule, has served nearly 300 professionals in 25 classes, logging more than 6,300 hours of training. Styles said the training program will be expanded to include training for staff workers and people who spend more time in the field than managers tend to do. Much of the state funding goes to equipment and costs associated with field training for the courses. But money is still available to add more offerings. This article originally appeared in the Tribune newspaper on Aug. 9, 2015. For more of the paper’s coverage on the California drought, please visit: http://www.sanluisobispo.com/environment-news/index.html. Stanislaus County Has a New Groundwater Database, but Does It Matter? Nick Wilson is a reporter for The Tribune.